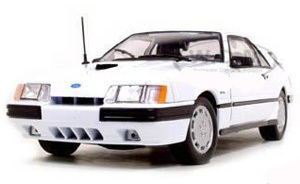 These very detailed, high quality Fox Body Mustang diecast cars are perfect additions for your collection. You'll find some memorable models here, including the Mustang Cobra and other Ford specials. Click on the blue links for more information. The Ford Special Vehicle Operations section was created to turn Ford's everyday grocery getters and sporty cars into something truly memorable, and of course powerful. And one of the crowning achievements of the program was the introduction of the SVO Mustang, with both, it's smallest and most fuel efficient, powerful engine, for the 1986 model year. Both, the 302 cubic inch V8, or 5.0 and the turbocharged 2.3 liter SVO Mustangs pulled a solid 200 horsepower. Many said it was to be the engine of the future for Ford and the Mustang. The crazy thing about it, is that they were probably right. Just some 29 model years ahead of their time (300 horsepower ecoboost engine for the 2015 Mustang model year ). Check out this outrageous 1986 Ford Mustang SVO , an amazing leap forward in performance for your favorite pony car. It's detailed 1/18 scale size is perfect! Unfortunately, these cars come and go. But don't worry, we'll keep searching for the perfect 1982 to 1993 Mustang cars. Stay tuned!